Although there are anecdotal hints that PRA has been with the breed long beforehand, it was first diagnosed in Glen of Imaal Terriers in the U.S.in August of 1996. The traditional way to deal with PRA was to get rid of the affected line as quietly as possible and start over. However, there was a problem with this strategy in our breed. The sire of one of the affected dogs, by default identified as a carrier for PRA, was a widely used sire around the world. 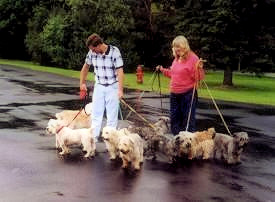 In April of 1997 the owner of the diagnosed dogs informed the rest of the Glen community at the American National Specialty in Washington D.C. The breed club immediately formed a health committee, set up annual eye clinics, and contacted Dr. Gregory M. Acland, a canine eye researcher at Cornell University. We are extremely fortunate that Dr. Acland agreed to work with our breed. After that first Glen eye clinic in the summer of 1997 when no dogs with PRA were found, we have been able to gratify Dr. Acland with at least one new affected every year. (As he says, a breeder’s nightmare is an eye researcher’s dream.) As the diversity of lines implicated by PRA diagnoses expanded, more and more people began testing worldwide. As of now we have approximately 30 affected and 40 known carriers out of 297 tested dogs. Dogs are known to be affected so far in the US, UK and Finland. An International Database was begun in 1998 which collects results from the US, UK, Sweden, Holland, France, Ireland and Germany. Some countries do not participate in the International Database but do test and keep their own results. When he is not on the road doing eye clinics or participating in conferences or research around the world, Dr. Acland splits his time between Cornell University in Ithaca, NY, where he is a Senior Research Associate at the James A Baker Institute for Animal Health, and the University of Pennsylvania near Philadelphia, where he is a Professor of Ophthalmology and the Director of the Retinal Diseases Studies Facility. PRA in Glens behaves differently than PRA in other breeds that Dr. Acland’s team has studied. Cells in the retina that receive light are called photoreceptors. There are two types of photoreceptors mixed throughout the retina; cones, which activate in the daylight, and rods, that activate in the dark. Normally in PRA the rods are affected first, causing night blindness, and the cones then begin to die because the rods are sick. However, in the Glens, they have determined both by electroretinogram (ERG) and morphological examination of the retina that it is the cones that get very sick very early in the progression of the disease. The slow progression of the disease in Glens is one of the things that slows down research. Dr. Acland has never seen a Glen show clinical incidence of PRA by ophthalmologic examination before three years of age. Some dogs affected at 3 had fairly fast disease; others sit stationary for variable lengths of time before suddenly deteriorating. Dr. Acland is also not yet aware of any Glen becoming affected that hadn’t at least tested suspicious by age seven. By testing Glen blood against markers that have already been identified for forms of PRA found in other breeds of dogs, such as Australian Cattle dogs, Portuguese Water Dogs, Briards, and so forth, they have found no match. Glen PRA is different from the PRA in other breeds of dog that have been studied so far. Specific forms of PRA in dogs are equivalent to human diseases such as Retinitis Pigmentosa, Leber Congenital Amaurosis, Achromatopsia, and cone rod dystrophy. Canine studies of PRA are yielding important research relevant to human RP disease. In fact the gene therapy work Dr.Acland’s team has done with Briards is now leading to therapy to cure Leber Congenital Amaurosis in humans. In comparing dogs to humans, people have a very small area of their retina called the fovea, which is made up only of cones with very high resolution. This allows humans to do activities requiring high-resolution vision, such as reading. Macular degeneration is an age-related disease affecting an increasing number of humans, as the life expectancy increases, by at first degrading high-resolution vision while the person still retains some sight throughout their field of view. In some cases, macular degeneration eventually leads to blindness, if photoreceptors beyond the fovea also deteriorate. Dr. Acland’s team is beginning to wonder what macular degeneration would look like in the dog. There is currently no natural animal model for macular degeneration. Dogs do not have as high-resolution vision as humans because they don’t have a fovea. However, if the Glen cone disease turns out to be the canine equivalent of a form of macular degeneration, it could become an exceptionally important model for humans. This would be good news for Glens, because it would assure continued funding of research into our breed. Dr. Acland’s research is largely funded by the National Institutes of Health, (NIH) which only really cares about curing human disease. Dr. Acland continues to advise breeders to regard Glen PRA as autosomal recessive. This means avoid breeding affecteds, and if breeding carriers, try to breed with a dog least likely to be a carrier. Most importantly, if you’ve got a problem for which there will eventually be a cure, as in Glen PRA, make sure you’ve still got a breed to work with when you finally do find the cure. Let’s heed the experience in Bedlingtons and Soft Coated Wheatens, where an overreaction to PRA lead to swapping a potentially blinding disease for several always fatal diseases. Once we do find the gene or marker for PRA in Glens, it will be possible to eliminate the disease within a couple of generations, as they have done in Briards, without endangering other aspects of Glen health by throwing out large portions of our gene pool. Will ERGs become a tool breeders can use in the near future to identify affecteds at a younger age? Electroretinograms (ERGs) are tests by machines that measure electrical activity in the retina, similar to EKGs that measure electrical activity in the heart. A research-level ERG differentiates between activity of rods and cones in response to different intensities of light after varying lengths of time that the eye has had to adjust to light or darkness. Research ERGs take about one hour per dog to complete, and the dog must undergo general anesthesia for the process. ERGs can distinguish rod function from cone function and can sometimes pick out abnormalities before clinical presentation. It’s not quite so effective if you have local disease at a particular spot in the retina because ERGs measure a general response of the whole eye. Dr. Acland has found that the new research ERG machine in his lab seems to be able to detect malfunction of cones in Glen PRA by a year or maybe 15 months of age, but none of it is developed enough yet for him to recommend paying $180 – $300 to have a clinical ERG done. It’s simply not ready yet. Unfortunately, the research machine is unavailable for clinical use. So far there have been a couple of different approaches for looking for the gene(s) or marker(s) responsible for PRA. The candidate gene approach is essentially a guessing method, where you make an educated guess based on previous experience and hope you get lucky. Given limited time and resources, this may be the only method available, but it is not a very efficient or effective method, unless you get lucky very quickly. Second, there is the mapping approach, which, if successful, tells you where the gene is "approximately". In effect, it tells you in which haystack you should look for your needle. You need large pedigrees, with multiple affected dogs, and a pretty good idea of the way the disease is inherited for the mapping approach to become feasible, and it has been relatively expensive and time consuming to undertake. With a late onset disease such as in the Glens where you might not know for years whether the dog you’ve tested and blood sampled is really affected or not, it is difficult to get pedigrees big enough to utilize this method effectively. Fortunately, technology for mapping genomes is advancing more rapidly than we had even imagined possible. The US government has invested millions of dollars in The Broad Institute at Massachusetts Institute of Technology; a huge factory full of expensive, state of the art machines and staffed by genetic engineers whose sole job is to sequence genomes. The original purpose of the Broad Institute was to map the human genome. One of the ultimate goals of genome sequencing is the development (currently underway) of computer chip-based technology for diagnosing diseases. This is where a drop of blood put in a device can be read by a computer chip and screened for any number of genetic diseases. Once the human genome project was completed, the National Institutes of Health began looking for other uses for their facility. Fortunately for us, the canine genome was chosen for the next project. Given the enormous number of genes possessed by organisms in a population, dogs have some advantages over humans when you are searching for genetic causes of disease. In humans, most genetic diseases are dominant, meaning only one gene out of the pair inherited from the parents needs to be mutated in order to cause disease. In dogs, most diseases are recessive, meaning both genes in the pair inherited from the parents are mutated. Also, unlike humans, dogs have been selectively bred to express specific traits, which further narrows genetic variation within specific populations. The first stage of the Canine Genome Project was to sequence one individual. They chose the most homozygous individual they could find, an extremely inbred boxer named Tasha. DNA from Tasha’s blood was chopped up and inserted in bacterial vectors so they would know where it was inserted, and then run through the sequencing machines many, many times over. Each time the machines read a completely random sample of the DNA. They repeated the process until the likelihood of enough overlap had occurred that the computers could compile a library of the bits of DNA – the first "map". Tasha is the canine reference genome, which was completely released to the public domain during the first week of July, 2004. There are errors in it, as there are in the human genome. Genome sequencing is never error free. But the first pass genome sequence of the dog is estimated to be 90% accurate. Now researchers can now merely log onto the Internet to bring up whatever parts of the sequence they need to look for answers to whatever questions they have. This has speeded up things enormously. For example, using the first pass genome sequence, Dr. Acland was able to accomplish in a half-hour what it had just taken him a month to do. The second stage of the Canine Genome Project was to look at a panel of dogs that should have differences from Tasha. They chose a very small number of dogs, including a Labrador Retriever, a Border Collie, a Beagle, and a wolf. These individuals, chosen to be most variable from Tasha, were sampled not nearly as completely as Tasha. But they were able to identify and disregard those sections of DNA that are identical and common to all breeds. The machines read the DNA millions of times until they felt they had a 95% probability of identifying all those sections, called Single Nucleotide Polymorphisms (SNPs), where a variation occurred as low as 10% of the time. The resulting Variation Map, called the SNP Map, is now completed but has not yet been released to the public domain. The SNP Map will allow researchers compare the canine genome with other species they already know, most importantly the human genome. The next stage of the Canine Genome Project will include Glen of Imaal Terriers. In order to thoroughly understand the SNP Map and use it effectively, researchers need a companion piece of information, called Linkage Disequilibrium (LD). Researchers cannot always identify the actual genetic mutation that causes disease. Often, they can only find markers, sections of DNA that always occur somewhat near the mutation. The team working on the Canine Genome Project hopes to have the LD map completed by the middle of 2005. They are selecting a number of dog breeds with different population dynamics, from a very large genetic base as in Labradors, to very small. One of the things they will learn from the LD variance between these breeds is how thoroughly they need to sequence a dog in order to get all the mapping information available in the pedigree. 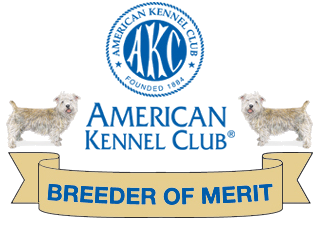 Dr. Acland has volunteered Glen of Imaal Terriers as an example of a small gene pool that has recently experienced genetic bottlenecks. We know, for instance, that Glens almost disappeared before a resurrection in the 1930s, and that again during World War II they almost died out, until some dedicated breeders and hunters revived them during the 1960s and 70s. Dr. Acland guesses that the effective population size for Glens might now be as low as 10. We jumped at the chance for our breed to be included in the Canine Genome Project. Now the resources of the Broad Institute will be applied to Glens. Although the Canine Genome Project has no interest in PRA, and although Glen genes will be sequenced less thoroughly than Tasha or the dogs participating in the Variation Map, the benefits to our breed will probably extend far beyond our PRA problem. Dr. Acland hopes to be able to use the Glen data from the Canine Genome Project to vastly narrow down the sites he needs to search for our errant PRA gene, and to vastly reduce the time it takes. Although there are no guarantees that it will work, the opportunity looks promising and we didn’t want to pass it up. So Dr. Acland gave us our task, almost impossibly difficult. We had to find 20 Glens, each with four unique grandparents. Thus, in theory, a cross-section of our breed would be represented by 80 different grandparents. We weren’t quite able to achieve this, so there is some overlap, with some dogs only representing three unique grandparents. Dr. Acland expected this, given the size of our gene pool. The end result is still that we have as broad a cross-section of the breed as possible. We included a couple of dogs affected with PRA and a couple of known carriers. A lot of people to whom we are eternally grateful went out of their way to promptly get their dog to donate 15-20 ml of blood for the project. Dr. Acland collected about half of the samples at the Glen gathering, and the rest was shipped to him from across the US, Japan and the Netherlands. Although the amount of blood required for genetic research scares some owners, the dogs don’t even seem to notice it. It is actually far less than the 50-500 ml that dogs are routinely called upon to donate for blood transfusions at the vets. The reason researchers need such a quantity is that DNA is only found in white blood cells. Whole blood is made up of about 50% red blood cells (that only carry oxygen), 50% plasma (the liquid part of blood), and when it is spun down, there is a thin line separating the two parts. That thin line contains the cells with useable DNA. A portion of the blood is reserved in case anything goes wrong; the rest is sent to Seattle, Washington where the DNA is extracted, and this is again divided up – a portion goes to the Broad Institute, a portion is held by the laboratory and a portion is returned to Dr. Acland’s team. The redundancy is a protection against things going wrong. These blood samples are precious and laborious to collect. It is better to not have to repeat the process. Will individual dogs that contribute the mapping project be identifiable? Not to the general public, no. The DNA gets chopped up and sequenced into base pairs. How many of these 1000-base sections are identical for all dogs of all breeds? Where different, how frequently does variation turn up? Answers to these sorts of questions will be released to the public domain. The engineers sequencing the genes don’t care about individual dogs and that information is not publicly retrievable from the database. There does have to be a complete audit trail assuring the integrity of the blood samples, and as a researcher Dr. Acland may be able to access the audit trail to assist in his search for the PRA gene. What is the importance of the pedigrees of the dogs for the mapping project? The primary purpose of the pedigrees is to select a broad cross-section of dogs in the breed to build the LD map. Very stable variations give chromosomes "fingerprints". If variant nucleotides are very close together they tend to stay close together for thousands of generations. The linkage disequilibrium distance is essentially the length of a chromosome over which the SNP alleles remain "in phase" . For most glens, once you trace their pedigrees back only a few generations, they all have the same small number of ancestors. This indicates an extremely low effective population size. The bottleneck effect lasts a very very long time. Severe founder effects (problems) do turn up. What if there are other breeds inadvertently mixed in with the Glen pedigrees? How would this affect the Mapping project or the PRA gene search? This is not a Glen of Imaal problem, it is a dog problem; most dogs have infusions from other breeds. Regarding the Mapping project, it shouldn’t matter too much. It’s another real-life facet of population dynamics, and it probably accompanies severe genetic bottlenecking in dogs more often than not. The Broad researchers are more interested in canine genetic variation and linkage disequilibrium than in the purity of any individual dog or breed. It is highly unlikely that outside infusions would reduce our sample goal of 80 unique grandparents to a smaller number. Regarding our PRA search, it shouldn’t really matter there either. Glen PRA is unique to Glens. If the mixed in breeds don’t have the Glen form of PRA, they won’t be showing the genetic variants that cause Glen PRA so they will be irrelevant. And if, for example, the infusion of another breed brought in a form of PRA where the rods got sick before the cones, which is a more common form of PRA, we would be able to determine that fairly easily. If the mixed in breeds did bring in another kind of PRA that acted like Glen PRA but were caused by a different gene, that could complicate things. However, the likelihood of that is very, very small. Should the owners of Glens that have been blood sampled for the Mapping project stay in touch and inform you if the health status of their dog changes over the years? Absolutely. Dr. Acland will be accessing the LD map when it becomes available to assist in the hunt for the PRA gene. One of the dogs whose pedigree fit the Mapping project requirements was not even a year old yet. There seems to be a window between ages 3 and 7 during which Glens develop PRA. So if you collect blood at age 4 you won’t know the true PRA status of that dog for several more years. Hence it is very important for owners of dogs who have donated blood for the study to keep the researchers apprised of any changes in the dog’s status as it ages. This can easily be done by contacting Maura High or Ara Lynn who originally recruited the Glens for the Mapping project. translated for print and electronic versions of Glen of Imaal Terrier newsletters. Ara Lynn, 202 Poor Farm Road, New Ipswich, NH 03071 USA.